The most consistent question brands and businesses have about social media marketing is, “how do I show ROI?” If return on investment is an issue for you and your company, then the Louisville Digital Association's May event is a must-attend! Leading social media strategist Nichole Kelly of Full Frontal ROI will present, “No Fluff ROI,” which will guide you through a systematic, measurement oriented and practical approach to connecting your organization's social media marketing activity to metrics that matter to your company and its executives. The May gathering of LDA will take place from 6-8 p.m. ET on Wednesday, May 16 at Interactive Media Lab at 124 North First Street in Downtown Louisville. Admission is free and the event is open to the public, but attendees are asked to RSVP for the event. Nichole is most widely known for her Full Frontal ROI methodology, which she will share in her talk, presented in frequent contributions to widely read social media blogs Social Media Explorer and Social Media Examiner. She is a frequent speaker at events like MarketingProfs, Social Fresh and Social Media Explorer's Explore events, as well as numerous PRSA, IABC and AMA talks. 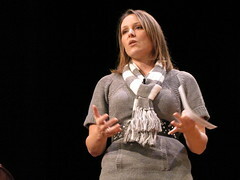 She is the CEO of Full Frontal ROI Consulting, the social media firm anchored on understand its customer's bottom line. She has been highlighted by leading organizations as a social media strategy and measurement expert including Forrester Research, Marketing Profs, Radian6 and HootSuite. Register to attend below and bring your note-taking device of preference. This event will get your brain working! By day Chris Theisen is the Director of Digital Communication for FlexPAC. By night he is a husband, father and social media junkie (ok thats all during the day too) The social media addiction led to his selection by the Indianapolis Super Bowl Host Committee as one of the #social46 tasked with promoting Indianapolis and the events surrounding the Super Bowl. You can connect with him on a myriad of social networks viachristheisen.com. As Super Bowl XLVI is in Louisville's virtual (and actual) backyard, we invited Chris to give us the lowdown on the digital outreach surrounding the big game. While the rollout of the first of its kind group hasn't been without its hiccups, I applaud the city for realizing the power community-driven content can have on a major event. I have already answered numerous questions and dispelled myths from the Indy community about attending Super Bowl 46 events. This entire event is as much for the city as it is for visitors from regional cities such as Louisville. As a Facebook friend of mine stated skeptically, “Isn't every Super Bowl from here on out going to be the most socially connected?” Yes they should be. While social media monitoring and community engagement is nothing new, and the LDA is obviously well aware of this, it has rarely been tackled (football pun intended) on this scale. The host committee is driving this area of the operation into the future with a social media command center. Mashable had a nice write up about it the other day and fellow #social46 member @petetheplanner gave everyone a sneak peak behind the scenes just the other day. While the bar has been set low from past Super Bowls I suspect Indy is going to set it rather high for future cities. I for one hope they all take our lead and better it. I would think the NFL is keeping its eyes on the Indy social media command center and wouldn't be surprised to see it brought in house for future Super Bowls. The NFL is notorious for its control of Twitter and other media outlets related to its product so this seems to be a natural transition to me. In the short time we have been given to promote the activities leading up to and surrounding the Super Bowl the #social46 have already written blog posts, curated a Storify, sent countless tweets and even leveraged traditional media (yes that still helps). In the days leading up to the Super Bowl many of us will be attending tweetups, visiting the Super Bowl Village, attending Media Day and the NFL Experience; all while our thumbs get a workout sharing tons of content. Do you see social media community involvement playing a bigger role in future Super Bowls? What about future large scale events of this kind? Leave a comment below and let me know what you think.